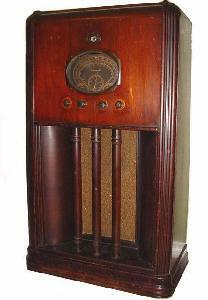 This large and splendid Coronado 47LL (series 7LL) radio was purchased at a VRPS auction. The cabinet was in very good shape and retains its original finish. However, the electronics had several problems especially in the first audio stage that caused the radio to squeal. The problem was solved by bypassing a 1000pF capacitor from the first audio amplifier tube grid to chassis ground.